Flowers, corsages and gifts are a traditional part of any school ball. Giving your partner a corsage is a perfect start to a memorable evening! 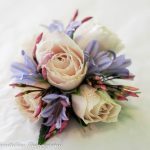 A corsage is a miniature flower arrangement made with fresh flowers, decorated with ribbon, beads, feathers… When ordering a corsage for your partner, you need to know the colour of her dress and whether she is wearing silver or gold jewellery. A corsage should be a stylish and sophisticated piece of floral jewellery… white flowers seem to be a firm favourite. The corsage should be ordered at least three days prior to the event and should be stored in a cool place, out of the sun. A small chilly bin with an ice pack should be perfect. 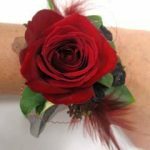 School ball.co.nz is only too happy to recommend the following Auckland suppliers of corsages, flowers and gifts. 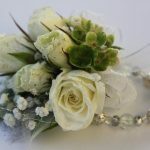 The floral team at Palmers Westgate can create a beautiful floral corsage & buttonhole for your school ball.